oh it's just adorable!!! i LOVE that stamp! 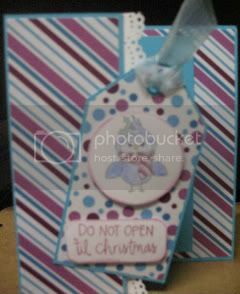 i used it for my card ;o) i really like your color choices! thank you so much for playing along with us at PKS! Helen, what a cute card!! Love the color scheme and the stamp you used! Thanks for playing along at Peachy Keen this week! What a great card Helen!! Good job w/this challenge! Thanks for joining us @ Peachy Keen this week! This is so cute Helen! I love the polka dot tag and the color choices. All the details really come together nicely! So glad you could play along with us at Peachy Keen Stamps! I love that cute birdie too Helen! He looks really sweet perched on that tag! Your colours are gorgeous. This is so cute! Thanks for playing, Helen!